It's actually quite a lot farther along right now. 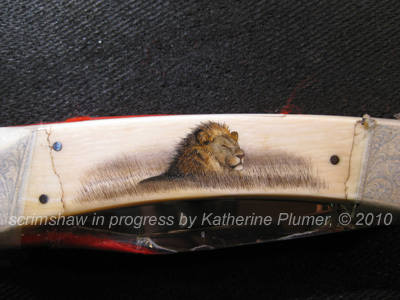 In fact, it's just about finished, just needs my signature and a few finishing touches, and it looks a lot different than it did earlier, but since it's sooooo close to done I'll just keep you in suspense a bit and show you the finished knives when I get a chance to take some good photographs! Ah, speaking of photos, over there in the right sidebar I've put a permanent link to my picasa albums. All two of them... If I ever find myself with a bunch of spare time (ha!) maybe I'll put some of my old adventures into a picasa album (like the trip to London and the trip to Idaho/Wyoming). That stuff is all on the blog, but I know it's easier for people to see in an album. Don't hold your breath though, I have a zillion things to do.